I came across G.Gerlach watches while browsing the affordable forums at watchuseek sometime ago; I became a big fan of their interesting designs and affordability, also every WIS was praising their quality. 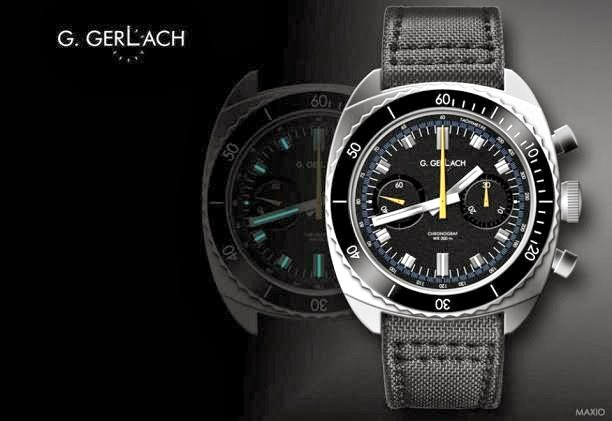 G.Gerlach is a Polish watch manufacturer, their inspiration is to show the world products with the proud “Made in Poland” label, products which are of the highest quality that they are proud of, which I think a very respectable inspiration with high patriotism values. Although I liked most of their designs, and fell in love with few of them, but no watch really spoke to me and made me pull the trigger, maybe due to funding restrictions at my end, or due to “No More Watches this Year” plan. This was over when I saw their new Chronograph, the Enigma, which should be released this summer, and it is opened for pre-orders. The word “Enigma” means “mystery” in Greek. Before the Second World War the German army launched new cipher machine named: Enigma. It was a portable electro-mechanical rotor cipher machine used for enciphering and deciphering secret messages. Because of possibility of changing rotors it was extremely hard to break using standard methods. In 1932 three young Polish genius mathematicians and cryptologists: Marian Rejewski, Jerzy Różycki and Henryk Zygalski, working for Polish military intelligence’s Cipher Bureau broke the Enigma system. Then Polish cryptologists designed “cryptologic bomb” – the electromechanical device which could break Enigma cipher automatically, this was on October of 1938. On 25 July 1939, five weeks before outbreak of World War II, the Polish decided to share the technology and equipped French and British colleagues with a “bomb” prototype. Breaking of Enigma was a one of the most important milestones in allied victory of World War II. This watch is G.Gerlach tribute for Marian Rejewski, Jerzy Różycki and Henryk Zygalski and their team who changed the face of the world we live today. The movement is a TMI / Seiko VK64 chrono movement, this movement features 1/5 swap second. This is a quartz movement with a sweeping second hand. The movement is very interesting in itself that I will dedicate a post to discus its technical details. The watch will be for less than $300 shipped, and for this value and tribute, I believe this is a lot of a watch for the money! ← Parnis, a pleasant surprise!